Looking for a fun backyard game for the summer? 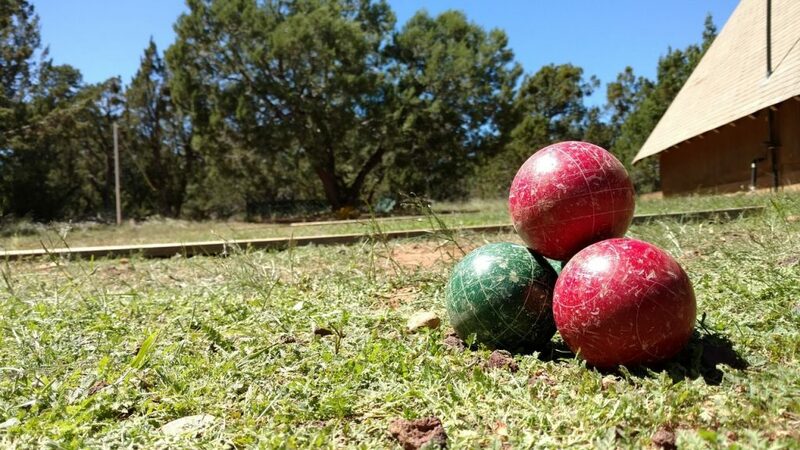 In this buyer’s guide, we’ll show you the 7 best bocce ball sets available right now. We’ll also outline some key things to consider when buying, to help you choose the right set for your family. First, we’ll review the 7 best bocce ball sets on the market at the moment. Looking for some help making a decision? Check out our buyer’s guide. GoSports’ set is designed for serious bocce players. The 100mm balls weigh in at 2lbs 5oz, making them fairly heavy. Although younger children may struggle to throw them, these balls have a nice, solid feel to them, so it’s really satisfying when you make an awesome shot. The balls also come in traditional bocce colors (red and green) and have square/circle regulation markings so you can tell which ball belongs to who. They’re also made of a high-quality poly-resin which doesn’t chip, crack, or lose its shine (for a number of years at least). Plus, you get a sturdy canvas carry bag, which has internal dividers to protect the balls. GoSports’ set also comes with a measuring rope, taking the guesswork out of scoring a match. The company’s customer service is about as good as it gets – they have a 100% satisfaction guarantee for peace of mind when buying. Considering what this set costs, we can’t fault it really. This is an excellent option for serious players and families alike. Regulation size & weight – nice feel to them. Comes with a measuring rope. N/A – great set for the price. Another regulation set designed for serious players is the Perfetta Club Pro. What makes this set special is its country of origin: it’s one of the only Italian-made bocce ball sets available in the USA. Unlike most other options which are made in China, the Club Pro is produced in the heartland of bocce. As a result, these balls roll straight and true, every single time. You simply won’t experience any weird turns or bounces with Perfetta’s balls. Plus, they come with a 10-year warranty against breakage. These balls are designed to last for decades, even if you play every week. They also maintain their luster really well, even when used on unforgiving surfaces like dirt or sand. In addition, you get an incredibly durable carry bag, and a regulation 50mm pallino. The balls themselves have their markings laser-engraved, meaning they won’t wear off like they do on cheaper balls. The only downside to this set is its cost. It’s pretty expensive, but you definitely get what you pay for. Considering that these balls are guaranteed to last for at least 10 years, they’re actually a pretty good deal if you play a lot of bocce. Incredibly well-made – feels amazing to throw. Comes with a sturdy carry bag. Durable – shine doesn’t wear down easily. Need something a little cheaper? Amazon makes an inexpensive bocce ball set that has a surprising amount of useful items included. You get a travel case (without internal dividers), instructions which show you how to play, and a measuring device for easy scoring. The balls are the regulation size and weight, meaning that children may struggle to throw them – Amazon says their product is suitable for ages 14+. They come in traditional colors and have handy markings so you can tell who threw the winning ball. However, this set has a bit of a durability issue. The balls are prone to chipping when used on hard surfaces, and they don’t retain their shine very well. After extended use, they may begin to look a little worse for wear. Although the balls play really nicely when thrown, they probably won’t last you for longer than a year or two of regular use. In addition, the carry case doesn’t have very thick walls, and its zips can break fairly easily. Since the balls are quite heavy, the bag can feel a bit flimsy at times. Comes with a carry bag and tape measure. Balls have a nice feel to them. Bag feels a little flimsy. For younger kids, 100mm 2lbs+ bocce balls can be a little tough to throw. If they get dropped and land on a little one’s toes, they’re likely to hurt more too. GoSports makes a 90mm ball set that’s perfect for children. You get eight balls painted in four different colors, and they remain bright even after being used for an entire summer. Although they’re fairly light (1lbs 11oz), they still feel great to throw, even for adults. Kids can get used to the underhand throwing technique with these balls – but when they’re ready to use something a little heavier, the transition won’t be too hard because the weight difference is minimal. This set is also very reasonably priced. Despite this, it doesn’t have any of the durability issues that plague most cheaper options (such as the Amazon Basics set). You also get GoSports’ 100% satisfaction guarantee, so you should be fine if anything goes wrong in the first few weeks of using the product. Plus, these bocce balls come with a canvas carry bag and a measuring rope. You can even choose to get them in soft rubber rather than resin, if you’re looking to save a few bucks. Includes a travel bag & measuring rope. Pretty durable considering what they cost. Not regulation size (not an issue for most families). If you love to play bocce on lazy summer evenings, you’ll understand how annoying it can be when the light fades before you’re ready to pack up. This makes it really hard to see dark blue/green balls, especially when playing on grass. Fortunately, Playaboule has come up with an incredibly simple solution to this problem: putting a light inside each ball, and making the shell translucent. Simply slide the batteries into the ball (a pack is included), press the recessed switch, and presto – you’ve got illuminated balls! The pallino even has a light, so you could use this set at midnight if you wanted to. At this point, you might be wondering what happens if the balls get a little wet or get hit really hard – would the lights break? Probably not, unless you smash them with a hammer or put them in a bath. Playaboule is so confident in the durability of their set that they offer a one-year warranty on the balls (90 days for the plugs). They also say that they’re waterproof – so the balls can handle damp grass, but can’t be used in your swimming pool (obviously). As these are regulation-size balls, they’re a must-have for serious bocce players. Although they’re a bit more expensive than most other options, it’s really good to have a set that’s versatile enough to be used at any time of day. Can be used for evening cook-outs & on camping trips. Regulation size – feels great to throw. Comes with batteries, a travel case & measuring devices. This is probably the cheapest bocce ball set on the market right now. It’s even less expensive than the Amazon Basics set. Like pretty much every cheap option on the market, this set isn’t incredibly durable. The plastic coating can crack and fall off the balls if they hit each other really hard. They can also fade after extended use, and won’t keep their shine as well as premium balls do. However, Franklin’s balls still feel nice to throw, as they’re 100mm in diameter and the resin is fairly heavy. You also get a carry bag, which comes with a comfortable handle. Considering how cheap this set is, you certainly get a decent amount of useful features. Ultimately, Franklin’s set is for occasional players or families who don’t throw the ball really hard. If you’re looking to save money, this is a great pick. However, if you play a lot of bocce, a more durable option like the GoSports 100mm set will probably represent better value for money in the long run. Another premium option is the Baden Champions 107mm bocce ball set. There are two things that set this product apart from similar options (like the GoSports 100mm set). Firstly, the bag is much more durable, and comes with a foam divider to prevent the balls from bashing into each other. Secondly, the balls are a bit larger (107 vs 100mm) but a little lighter (2lbs). However, they’re still within official size and weight regulations. These balls are also very durable – you won’t have any issues with cracking, although they may begin to develop small chips/scuffs after a few frames. This is fairly normal for most bocce balls though. You get a 90-day warranty, so there’s no need to worry about them breaking on their first throw. As you’d expect for something at this price point, the Baden bocce ball set comes with a measuring tape, and the balls have circular/square patterns so you can tell them apart. They’re nice and hard, and the poly-resin gives off a nice thunk as you smash into another ball. The only thing we can criticize this set for is the price. Although the balls are really well-made, we’re not sure it’s worth the extra money. Really well-made balls – feel great to throw. Balls can fade relatively quickly. Now we’ll show you what you need to know when choosing a bocce ball set. What does a bocce ball set contain? 8 bocce balls (in two or four different colors). 1 pallino (sometimes called a “jack”) – this is the smaller target ball. A case to hold the balls. A measuring tape, to determine which ball is the closest to the pallino. A much sturdier case with a shoulder strap, to make the set easier to transport. What are bocce balls made of? 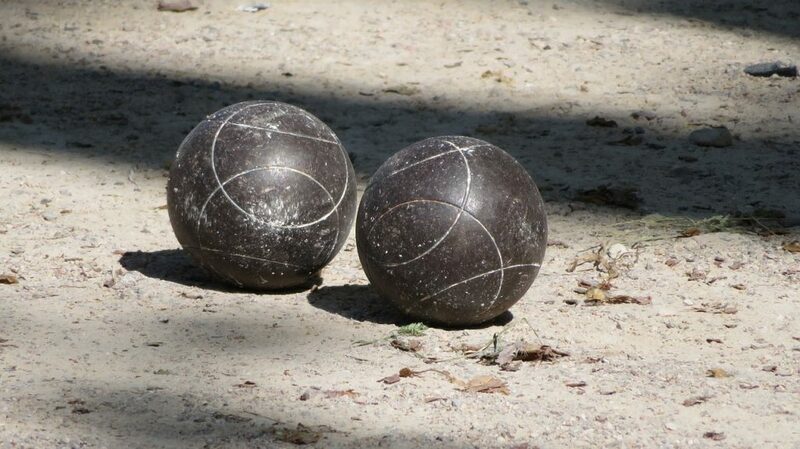 Most bocce balls are made of resin or a poly-resin compound. However, there are also softer rubber varieties on the market these days. If you’d prefer something a little lighter/safer for children, these rubber options can be worth looking at. According to the Bocce Standards Association, tournament-grade bocce balls must measure between 100-115mm in diameter and weigh around 920 grams (2lbs 0.5oz). The important thing is that the balls are all the same size and weight. The pallino should measure 40-60mm in diameter and be made of similar poly/resin materials. Don’t buy bocce balls that are filled with water – look for solid ones instead. Liquid-filled balls can leak even if they get only a very minor chip, and this will be really hard to fix. Metal bocce balls are obviously going to be more durable (especially when used on dirt/gravel) but are much more expensive. As we mentioned above, the Bocce Standards Association actually specifies that tournament-grade balls must be made of plastic. 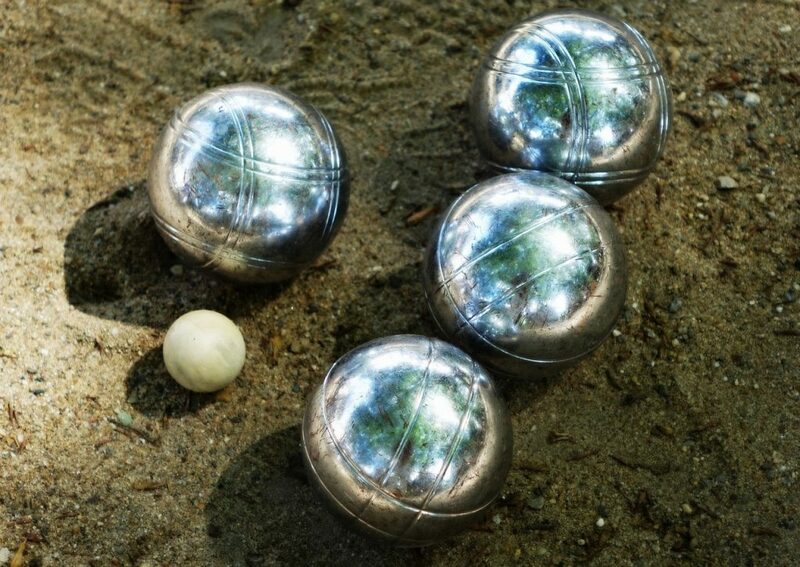 Most of the metal balls you’ll see online are actually pretty small (73mm or so) and are typically used for variations of bocce such as pétanque. Unless you like the feel of metal (or like to play variations of bocce), it’s probably best to stick to plastic. What do the lines on a bocce ball mean? You might’ve noticed that most bocce balls have a certain pattern on them. This isn’t anything to do with how the ball actually performs – bocce balls should have absolutely no bias to them, unlike lawn bowling balls. Instead, these lines can be used to determine who threw each ball. For example, if you’re playing doubles but have a set with only red and green balls, the markings should allow you to split the balls into four groups – two for each player. Playing by the official rules of bocce is by no means essential. However, in case you’re curious, here’s how the sport is meant to be played. The bocce field is a rectangular area 60′ long and 12′ wide marked on sand, dirt, or grass. This court is then divided into two equal halves with a line parallel to the short edges. Four more lines are then drawn parallel to the center line, two of them 10′ from each short edge and two 4′ from each short edge. After making these markings, there should be six areas inside the court. A coin is tossed, and the winning team can throw the jack from one end of the court to start the match. It must land in the playing area between the 10-foot and the 4-foot line at the opposite end of the court. If they miss, the other team can throw the pallino instead. Once the jack is in position, each team takes it in turns to throw their bocce balls. The aim is to get their colored balls as close to the jack as possible – hitting opposition balls out of the way is permitted. 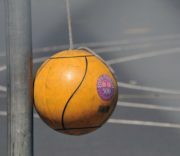 A team scores points if one of their balls is closer to the pallino than any of the opposing team’s balls once all of the balls have been thrown. They get one point for each ball that is closer to the jack than any of the other team’s balls. This means that only one team scores in a game. If a ball is knocked out of the court, it is considered dead and can be ignored. If the pallino rolls out of play, the frame resets and no points are awarded. Sometimes barriers are put up on the back half and sides of the court to prevent this from happening. After the scores have been tallied up, the next frame begins and the process repeats itself, with the winning team beginning the next frame. The first team to 7, 13, or another pre-determined number of points wins the game. Are cheap bocce ball sets worth buying? For the most part, no they’re not. Cheap bocce balls are prone to splitting, chipping and losing their shine, because they’re often made in China. This means that you might find yourself needing to replace your set within a few months of buying it. But if you’re buying the set for a one-off game, cheap options are worth considering. On the other hand, more expensive sets will have better-quality balls, which are sure to last for more than just a single summer. They will also typically come with a sturdier, more comfortable carry case, plus a heap of useful accessories (like a measuring rope). The best balls on the market (in terms of overall quality) are those made in Italy – a set of these will likely cost you $100+. Ultimately, if you’re serious about bocce, it’s definitely worth investing in a quality set. When buying a set that children are going to use, it’s a good idea to avoid metal. Go for a relatively light plastic option, with balls that have a diameter of around 85-95mm. This makes them easier for little ones to pick up. Toddlers in particular love bright colors. If you go for a four-color set, you can begin to teach them to recognize red, yellow, green and blue through games of bocce. These days, some companies make bocce balls with lights inside them. The Playaboule lighted set is one such example. They’re battery-powered (usually by those disc-shaped batteries) – simply slide them in, press a recessed switch, and you’re good to go. Once you’ve got them set up, the balls (including the jack) will emit a pretty bright light, because the outer shell is translucent. These balls are sure to impress – they’re great for BBQs, camping, and tailgating. The only downside to getting illuminated balls is their cost. You’ll also need to buy batteries for them. However, the premium options tend to be surprisingly durable, meaning the lights won’t break as easily as you might expect. Hopefully you found the right bocce set for your needs! If you’re still not sure what to get, leave a comment below for a response within 24 hours.